...so I decided to post the first thing I found on YouTube. Addendum: This is the first movement, molto alllegro, of Symphony No. 40 in G Minor, K. 550, performed in 1998 by the Georgian SIMI Festival Orchestra, Anzor Kinkladze, conducting. Pierce Turner: "Ball and Chain (Snakes and Ladders)"
Pierce Turner was one half of Turner and Kirwan of Wexford, the house band at the Bells of Hell from sometime in 1977 to 1979. The band was just the two of them: Pierce played Moog; Larry Kirwan played guitar while using a pedal to strike a drum; and both sang. Their repertoire included some original songs ("Absolutely and Completely", "Father Reilly Says Goodbye", "The Girl Next Door"), arrangements of traditional Irish songs ("Free Born Man of the Traveling People"; a version of the rebel song "The Foggy Dew" ending in Moog pyrotechnics), and covers ("Death of a Clown", "Lola"--they were great Kinks fans--and the New Riders' "Panama Red", which, to their chagrin, a certified public accountant named Stu would frequently and loudly request). Toward the end of their time at the Bells, they were producing more original material. They added a bassist and a full-time drummer, and changed their name to The Major Thinkers. As such, their music evolved into a kind of post-disco electronica with new wave overtones, done very well. (I still have an unscratched Major Thinkers twelve inch disc.) You can hear them here. Today, Larry fronts Black 47, and Pierce is a solo artist. His latest is in the clip above (thanks to odriscl for the clip and to Bells/Lion's Head friend Cheryl Floyd for the link) and, in my opinion, shows him still at the top of his game. I will be performing at Joe's Pub on March 3rd at 7pm-I have a new album pending-I'm mixing right now-and I think fondly of those Bells of Hell days. I hope to see lots of my New York friends there. Meanwhile, I've found a video clip of "Wicklow Hills", a song that's on Pierce's first solo album, and which I heard him perform live back in 1983. About a month after attending his concert, I was walking along Hicks Street in Brooklyn Heights, my then new home, late at night, when a drunken man came by singing, "Tell everybody I'm going away for ten years; I'm gonna wander, among...those...hills." I bit my tongue to keep from shouting out, "Wicklow!" I don't think Joe Paterno, who died today at 85, will have the fate Shakespeare's Antony described in Juluis Caesar, Act 3, scene ii: "The evil that men do lives after them; The good is oft interred with their bones". 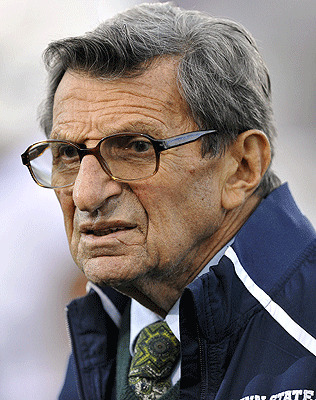 The evil of which Paterno was accused so near the end of his life was a sin of omission, but one that may have had very bad consequences. Fellow blogger Mark Koltko-Rivera, writing at the time the scandal had just broken and before Paterno was fired as Penn State's football coach, made a case, on both consequentialist and deontological (if, indeed, there is a real difference between the two) grounds, for firing Paterno immediately, thereby denying him a "last hurrah" at the Nittany Lions' then forthcoming end-of-season game. Joe Paterno was a native of my now beloved adopted home, Brooklyn. He coached at a university near where my mother was born and raised and where I was born, whose teams I rooted for whenever they weren't playing against Florida or Florida State. I believed, and still believe, in his reputation as a good coach, not only in the sense of being a winning coach, but one who inspired respect and love from his players while instilling or reinforcing in them ideals of good conduct and devotion to learning, as well as to football. I don't think this reputation will "be interred with [his] bones", nor should it. The "evil" will also be remembered, and should serve to caution others who find themselves in a situation similar to that in which Paterno found himself when confronted with the information he was given.